'In Focus: Perspectives in Board Gaming' is an exclusive series from Punchboard Media that spotlights diverse perspectives across the board gaming industry. Our guest this week is prolific board game artist Kwanchai Moriya . The interview was conducted over email by Eric Buscemi. Kwanchai, you've done the artwork for a lot of tabletop games -- including Bosk, Capital Lux, Catacombs, Cryptid, Gorus Maximus, Dinosaur Island, Favelas, In the Hall of the Mountain King, Loop Inc., Overlight, and Trash Pandas -- but before we talk about that, do you enjoy playing tabletop games? If so, do you prefer board games, card games, or role-playing games? Any favorites? Yes! I was playing board games fervently before I was able to become a part of the industry as an illustrator. I try to keep my collection under 400 if I can, and we play everything in this household! Board games, card games, and I’m currently GMing a D&D group and a Delta Green group. A few things I’ve really been digging lately: Architects of the West Kingdom, Brass: Birmingham, A Feast for Odin, Veins of the Earth (an OSR sourcebook), and The Things We Leave Behind (a Modern Cthulhu sourcebook). Some of my favorite games of all time: Blood Bowl: Team Manager, Homesteaders, Suburbia, Space Hulk, and Galaxy Trucker. Have you had the chance to play any of the board games that feature your artwork? If so, do you have a favorite of those to play? I have played most of the games I’ve worked on. I’d say my favorite games to play that I’ve done artwork for would be Catacombs and Dinosaur Island. Oh, and we play The Mind using cards from my redesigned version of The Game (the Target one from Pandasaurus). What is your artistic process like? Do you work entirely digital or are you more old school? It depends on the project, since I have a few different styles and mediums that I pull from. I use both acrylic paints and a 22” Cintiq tablet to get work done, sometimes in conjunction and sometimes separately. What's been the biggest challenge with creating art for games versus any other medium? Games are awesome to illustrate because there’s so many things to illustrate: game board, box cover, cards, tokens, player aids, etc. And each of the components is a chance to do something fun, artsy, and unique to further the theme and immersion of the game. The hard part of illustrating games is that there’s so many things to illustrate, and I’m going to bang my shins against every hurdle until I stumble across the final due date. What kind of deadlines do you have when you work in the board game industry? It varies wildly, anywhere between a few weeks and six months to wrap art on a project. More concerning is the fact that all publishers need to hit the same print deadlines in order to showcase at the same fall conventions and make the same distributor deadlines in time for the holiday season. This means that a lot of folks: 1) pitch a project in December after convention season dies down, and 2) want art wrapped by March/April in order to hit print in time for Gen Con. And I usually have about five different gigs I’m working at a time, so it is hell trying to wrangle the same scheduling windows. Are you able to play prototypes of the games you help create before you work on them? Do you think playing the games would help you create the art for it, or would it just be a distraction? Anything more than a card game, and you really need to be messing around with a prototype before sketching. There’s just so many moving parts to visualize and the art really needs to serve the game mechanics more than anything else. You were one of the artists for Flip Ships. Did you design the Flip Ships ambigram that is on the cover, which reads the same upside down as it does rightside up? No that wasn’t me, it was Anita Osborn and her graphic design team at Renegade Game Studios. My logo idea was boring and samey. I think most of my typography and logo work is adequate at best. While we’re on the subject, my graphic design in general is adequate at best, though I’m working on it! The color palette for Dinosaur Island has been very divisive. What made you decide to go with such bold, vibrant colors for that cover? I get it. It is kind of garish, to be honest. Though some might say it is subtle in its genius and ahead of our time. No, nobody says that. Pandasaurus gave me references and concepts to jump from, and boy did I jump. I’d like to put forth the contention that my strength as an artist is not subtlety and nuance. A lot of my energy thus far has come from doing fresh, varied things from game to game and making bold attempts at style. 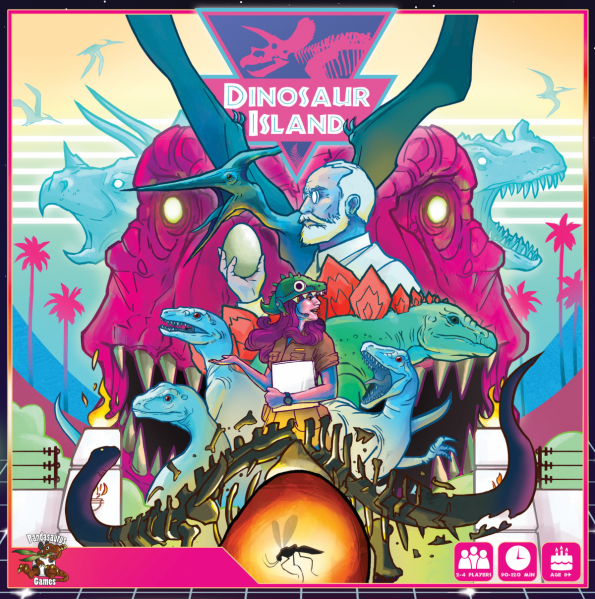 In fact, I really like the cover I did for Dinosaur Island. But, when the opportunity to do a cover for Dinosaur Island’s Totally Liquid expansion came along, I did treat it as a kind of second attempt at doing a radder, badder Dinosaur Island cover. How different was it creating the art for the Overlight role-playing game, with its focus on world-building and story telling, as opposed to a board game? It was different because I’d never painted that much in my entire life. It cost me two blown-out wrists and more than several gray hairs. Equal parts thrilling and horrifying. Are there any upcoming board game projects that you are working on that you can tell us about? There’s so much I can’t really talk about, but High Rise from Formal Ferret Games and In the Hall of the Mountain King from Burnt Island Games are both games that I think represent some of my best work yet and are coming out soon. I can see myself getting better as an artist and that’s exciting because I feel like I have my best work ahead of me. Is there a game or games that you didn't do art for that you wish he could have? Suburbia is number one on that list. Mmmm, maybe Evolution? Publishers have been extra awesome in the last few years and I’ve been getting so many great opportunities. I feel like a kid in a candy store with the projects I get to choose from. Who are some of your favorite artists working today in the board game industry? Beth Sobel, Jacqui Davis, Ian O’toole, Kyle Ferrin, and many more. Proud to have my art share space on the same shelves as them. Before we wrap this up, is there anything else you would like to tell us about yourself? Any other hobbies or passions? If any of your esteemed readers find the artwork in a game is particularly awesome, take a second to shout it from the mountaintops of social media! Moreover, please tag the artist and the publisher. This gives an artist a much needed ego boost and subtly hints to the publisher that they should keep them around.